Increasing conversions by standing out in a crowded market. Ingenuity are a new business consultancy – they help agencies to find brands and brands to find agencies. They do this by running speed dating events, as well as providing more personalised consultancy services such as lead generation, content creation and PR. Having already designed and built their previous website several years prior, and having watched their business grow and expand into new markets since, we were asked to design and build their new website to communicate their full range of services. Previously, the Ingenuity brand consisted of muted colours and dated illustrations to represent each service offering, hampering their ability to stand out from the crowd as a leader in their field. As part of the new project, we gave Ingenuity a fresh new look with an updated logo and colour palette, switching from illustrations to a modern photomontage style. Without embarking on a complete re-branding project, the logo was evolved from the original illustrative design to a more professional and impactful version. The colour pairings used across the site are unique per service, so users begin to associate certain colours with certain sections of the site and are quickly able to orientate themselves. When moving between pages, a branded “swipe” transition is activated whilst the content loads in the background, using the colour pairing unique to that service. The main content pages of the site that describe Ingenuity’s services are all based off the same master page template. This template was created to cover a range of content types, from testimonials and accordions to tabbed content and events listings. For the mobile and tablet versions of the site we chose to strip back some of the complexity while at the same time keeping a consistent style and introducing some advanced but simple navigational and UI touches. One of Ingenuity’s key service offerings is their speed-dating style networking events, where agencies have the chance to meet a brand face-to-face for 15 minutes, before the buzzer sounds and they have to swiftly move on to the next room. 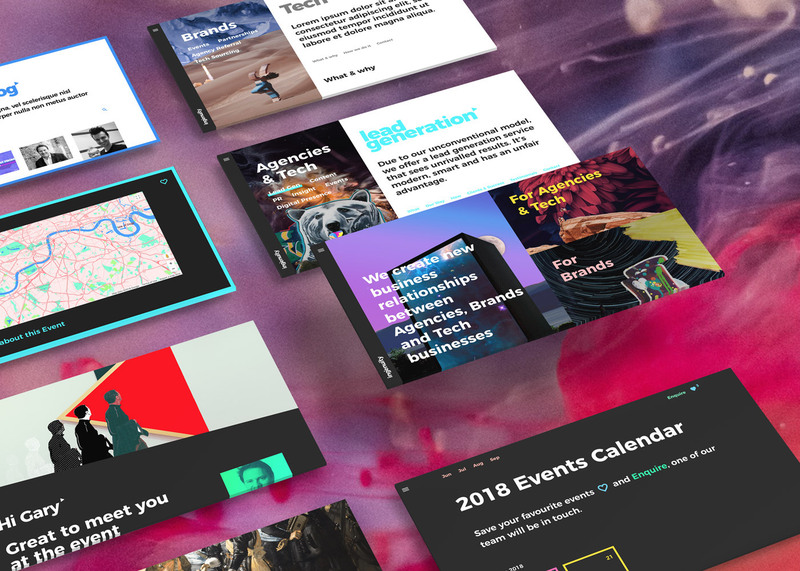 To allow both agencies and brands to learn more about Ingenuity’s unique events, we built a fully-functional events calendar, allowing users to view, favourite and enquire about events they’re interested in directly from the website. The events feature progressive new UI patterns including proximity activated animated buttons and custom multi coloured maps. Alongside their events service, Ingenuity also offer exclusive access to a subscription based private members portal, where agencies can be the first to hear about new business opportunities and keep up to speed on the movers and shakers and latest trends in their industry. To support the launch of the new website, we also designed and developed the restricted membership portal as an extension of the project.